Whether or not to incorporate fat bombs in your keto life is a personal preference. You want to be sure you utilize these as a very tasty, on occasion treat because you can easily consume too many to kick you out of ketosis. I for one, use them for my kiddos to have a much healthier, full fat treat than grabbing a bag of candy and will occasionally have one myself. One or two will do! With this recipe I learned a few things along the way. I shared the tips at the end of the post to make these fat bombs a success. 1. Chop macadamia nuts in a food processor until you reach a finer consistency and set aside. 2. Dice strawberries in small pieces and set aside. 3. Heat coconut oil in a small pan on low-medium heat. Careful not to make it too hot as it will cause the chocolate to scorch. Stir in Lily’s chocolate chips (can be found at whole foods stores or online) until fully melted. 4. While chocolate is still warm, pour directly into silicone molds on a flat surface, filling 3/4 of the way full. 5. Place silicone mold in the refrigerator for 5 minutes or so. Careful not to let cool too much as all the toppings will sit on top. 6. Remove mold from refrigerator and add macadamia nuts. Place back in the refrigerator for an hour to allow firming. 7. Test removal from the silicone mold, if it doesn’t remove easily, allow more time to cool. You can also flip the mold over and run under warm water to allow for easy removal. Once cooled completely, place in foil or a container in the freezer. 8. Enjoy your chocolate macadamia nut fat bomb as an occasional treat. If you want the toppings to sink and mix into the chocolate, add toppings prior to refrigeration. 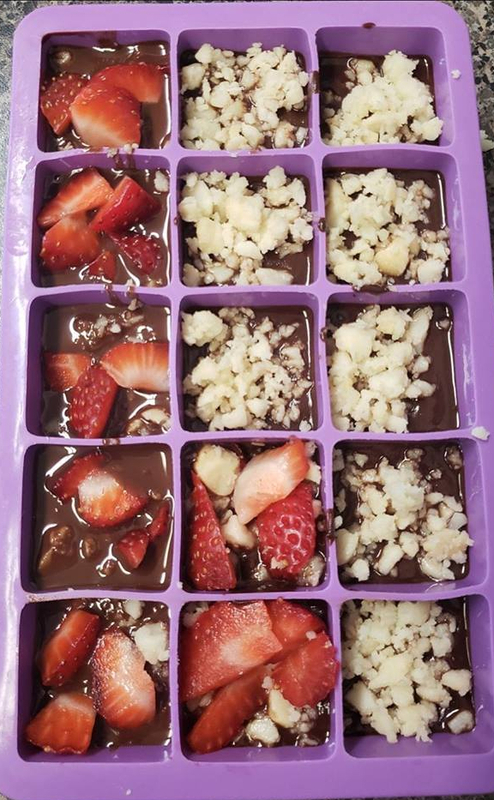 Add strawberries on top once refrigerated because the moisture from the berries causes the chocolate not to firm up and makes for difficult removal from the silicone mold.